FILE - A supporter of LGBT rights holds up an "equality flag" on Capitol Hill in Washington, July 26, 2017, during an event in support of transgender members of the military. U.S. Defense Secretary Jim Mattis has yet to send guidance to President Donald Trump on whether transgender troops should serve in the military, according to the Pentagon. The deadline for his recommendations was set for February 21. Last September, the Pentagon said it began studying how to implement a directive by Trump to prohibit transgender individuals from serving. 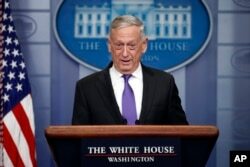 On Wednesday, Pentagon spokesman Major Dave Eastburn told VOA that Mattis "has his recommendation for the president but has not provided it yet." "When he's ready to provide it, he will," Eastburn added, noting that Wednesday's deadline for submitting a plan was one made within the Department of Defense and not one set by Trump. FILE - Defense Secretary Jim Mattis speaks during the daily news briefing at the White House in Washington, Feb. 7, 2018. Pentagon officials said they would not discuss details of the secretary's recommendations to the president because it was a "private matter" between Mattis and Trump. Eastburn said the Pentagon anticipates Trump's policy announcement on transgender service members "no later than March 23." Trump tweeted his desire to ban transgender people from serving in the military in a string of Twitter comments in July. He said he was ordering the armed forces to stop allowing transgender individuals to serve after consulting generals and military experts. He also tweeted: "Our military must be focused on decisive and overwhelming victory and cannot be burdened with the tremendous medical costs and disruption that transgender in the military would entail." Hours later the U.S. military's top general stressed to Pentagon leaders that there had been no change to the military's policy on transgender personnel despite Trump's announcement on Twitter. "There will be no modifications to the current policy until the President's direction has been received by the Secretary of Defense [Jim Mattis] and the Secretary has issued implementation guidance," the chairman of the Joint Chiefs of Staff, General Joseph Dunford, wrote in a memo obtained by VOA. Federal courts rejected parts of Trump's proposed ban, which sought to overturn an Obama administration policy that said transgender troops could apply to join the military, serve openly, and seek medical care. Recruiting of transgender troops began January 1, after Trump's administration decided not to appeal federal court rulings that rejected the administration's request to put on hold a judge's orders requiring the military to begin accepting transgender recruits. The RAND Corporation has estimated that the number of transgender individuals currently serving in the active component of the U.S. military is between 1,320 and 6,630 out of a total of about 1.3 million service members.